Simplesmente muito bom, bem localizado, organizado e limpo. The best hostel that I have been. The staff is polite, the decorations are incredible, and the rooms and toilets are clean. By the way, it is cheap and located in the best possible place in Edinburgh. Eu amei minha estadia, um dos melhores hostels que eu já fiquei!!! Very nice hostel, the rooms have plugs for each bed which is really nice! The bathrooms were very clean and people were very respectful. Location is perfect! I would totally recommend the hostel for a friend. Excelente Hostel, muito bem localizado, staff atencioso, banheiros, quartos e áreas comuns limpíssimas, galera se respeita. Muito bom ambiente mesmo! Recomendo de olho fechado! A localizacao do hostel e excelente. A limpeza do local e boa. Os funcionarios sao simpaticos, te atendem com presteza. O cafe da manha nao e bom, melhor comer fora ou comprar algo pra preparar la. A seguranca e muito boa, nao tive nenhum problema. 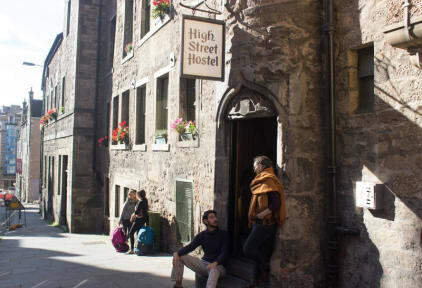 I and my friends had a great time in the High Street Hostel. The rooms are clean, they have a good infraestructure and good showers as well. There are free coffee and tea, the kitchen is spaceus and you can cook. Friendely staff and atmosphere. The hostel has the worst Wi-Fi connection I have ever seen, even to use whatsapp was hard sometimes. The rooms are nice and clean and the guest kitchen is huge (which helps a lot). The location is excellent.